Have you been considering a network assessment for your business but not sure what exactly that means, or how the assessment benefits your business? These are common questions and thoughts to have. Business technology isn’t the simplest undertaking to learn, or the most entertaining—so that’s why we’re here! Let us break it down for you. A network assessment is a detailed report and analysis of your company’s existing IT infrastructure, management, security, processes, and performance. The purpose of the assessment is to identify opportunities for improvement and get a comprehensive view and current state of your existing network. This helps you make more informed and strategic business decisions. A network assessment often starts with the realization that your organization’s IT systems have grown to the point where you’re not sure what all is occurring everywhere on the network. Or, certain components of your IT systems have started failing or giving you trouble. You might have a general idea about what may be causing the problems but unable to verify it without a thorough analysis of all network vulnerabilities and components. Additionally, you may not want to undertake a major new network configuration without first understanding the current situation of your network infrastructure, systems, and processes. To do so, reach out to a qualified managed IT services provider. As a heads up, most qualified managed IT services providers charge a minimal cost for network assessments. To learn more about managed IT services and how they can assist your business technology needs, read our article, What is Managed IT Services? How to Tell If You Need Them. 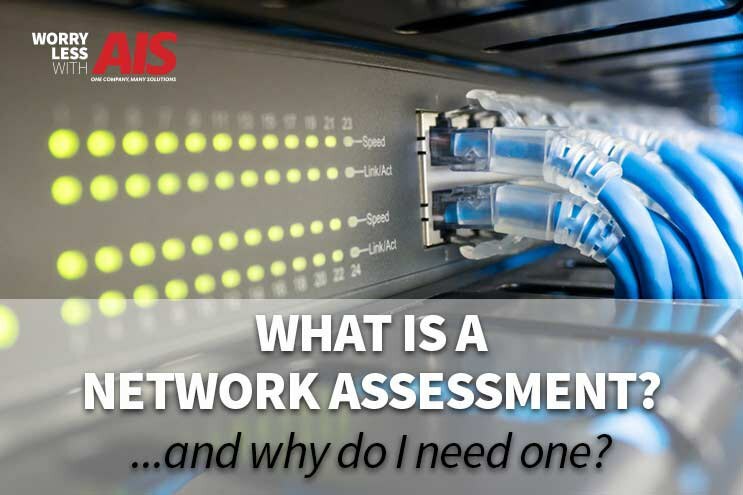 Network Assessment: Does My Business Need One? During a risk assessment, all of the devices on your network are examined and analyzed. A network assessment looks at how each of these devices (such as computers, laptops, iPads, servers, routers, etc.) are managed. Some of these devices have compliance modules that the assessment picks up, such as PCI and HIPAA compliance. During a network assessment, a managed IT services team also studies (or scans) the exchange server. These scans test for anomalies or issues specific to compliance. A network assessment has the power to identify atypical data or anything that may stand out—outside of compliance. To learn more about the approach of a network assessment and how to perform one, read an article published by HashedOut, How to perform a cyber risk assessment. A managed IT services company can use many different tools used when running a network assessment, such as RapidFire Tools. Whether your managed IT team used RapidFire tools or others, it’s important to know what these tools do as they’re analyzing your network. All of these tools are part of a service that your managed IT services provider can offer your business. Even though these tools are excellent and valuable resources to have, it’s important to know that the tools can only do so much. You could have all the data in the world, but still, have no clue what’s going on within the wires, devices, and storage of your company. Data doesn't have value unless you know how or why something happened. Yes, a managed IT services company gives you the power of the information, but they should also give you access to interpret and understand the data. It’s impossible to understand what your network is telling you unless you understand what you, as the user, is doing wrong. To relate this more easily to you, think of this as if you’re reviewing an x-ray of your leg after you broke it. A doctor can take as many x-rays as he wants, but if he doesn’t explain the x-ray to you, it has no value. On the contrary, if you don’t explain to the doctor how you broke your leg in the first place, he might not know the best ways to treat you. So back to your networked devices, it’s imperative to learn how the computer, or user, got to a specific place of risk. It’s important to make sure you’re using the best tools, provided by the best managed IT services provider for your specific business needs. Learn how to find the best managed IT services company by reading our article, How to Find The Best Managed IT Services Company Near Me. Before we wrap up, we’re sharing some common network risk assessment results we’ve seen that stress the importance of the assessment. These are excellent references to use while you review your network risk assessment. Issue: Computers were found using an operating system that wasn’t supported. Unsupported operating systems no longer receive necessary security patches and present an inherent risk. Recommendation: Upgrade or replace these computers. Issue: Anti-spyware software was not detected on some computers. Without adequate anti-virus and anti-spyware protection on all workstations and servers, the risk of acquiring malicious software is significant. Recommendation: To prevent both security and productivity issues, we strongly recommend assuring anti-spyware is deployed to all possible endpoints. Issue: User accounts with passwords set never to expire, present a risk of use by unauthorized users. They are more easily compromised than passwords that are routinely changed. Recommendation: Investigate all accounts with passwords set to never expire and configure them to expire regularly. Issue: Computers were found using an operating system that is in extended support. Extended support is a warning period before an operating system is no longer supported by the manufacturer and will no longer receive support or patches. Recommendation: Upgrade computers that have operating systems in extended support before the end of life. Remember, a network risk assessment is only the first step in the process of ensuring your network is secure. Once you know what your weaknesses are, you can begin to plug those security holes. Our goal at AIS is to educate you and your employees on the best business practices to ensure business growth and success. We believe in helping our current, and future customers make the best decisions when it comes to office technology. If there’s anything we didn’t answer regarding network risk assessment and tools, or you’d like to learn more, reach out to one of our business technology consultants. Don’t forget to check out our video channel on YouTube, The Copier Channel. We’re here to give you peace of mind, to help you win more business.